Those of us who have attained a certain age can remember being bombarded by commercials in which we were asked "Is it live or is it Memorex?" The thrust of the ad was that it didn't make any difference, that the tape recording was just as good as being there to watch that TV show live. Video recording technology was in its infancy, and the ability to play a movie whenever you wanted was really cool. Imagine being able to set a video recorder to record a TV show while you were away! … As long as you had somebody in the house young enough to be able to program the recorder to do it, it was great technology. Today investors are asking themselves a similar question: "Is the meltdown in the stock market the result of Fed tapering, or is there something else going on?" We'll address that question today and take a deep plunge into the emerging markets. We have a good old-fashioned central banker throwdown in progress, and if the results didn't have such an impact on our investment portfolios, it could actually be quite fun to watch. What happens in the emerging markets will unfortunately not stay in the emerging markets. It's all connected. There is more happening here than a simple correction. Let's put our thinking caps on and try to connect some dots. This unprecedented global monetary experiment has only just begun, and every central bank is trying to get in on the act. It is a monetary arms race, and no one wants to be left behind. The Bank of England has devalued the pound to improve exports by allowing creeping inflation and keeping interest rates at zero. The Federal Reserve has tried to weaken the dollar in order to boost manufacturing and exports. The Bank of Japan, not to be outdone, is now trying to radically depreciate the yen. By weakening their currencies, these central banks hope to boost their countries' exports and get a leg up on their competitors. In the race to debase currencies, no one wins. But lots of people lose. Emerging-market countries like Brazil, Russia, Malaysia, and Indonesia will not sit idly by while the developed central banks of the world weaken their currencies. They too are fighting to keep their currencies from appreciating. They are imposing taxes on investments and savings in their currencies. All countries are inherently protectionist if pushed too far. The battles have only begun in what promises to be an enormous, ugly currency war. If the currency wars of the 1930s and 1970s are any guide, we will see knife fights ahead. Governments will fight dirty, they will impose tariffs and restrictions and capital controls. It is already happening, and we will see a lot more of it…. We are already seeing the unintended consequences of this Great Monetary Experiment. Many emerging-market stock markets have skyrocketed. Only to fall back to earth at the mere hint of any end to Code Red policies. Emerging-market countries have to fend for themselves. Bernanke, Kuroda, and other developed-country central bankers accept no responsibility. If other countries don't like a weaker dollar or yen, too bad. Bernanke places the blame, not on the United States for weakening the dollar, but on emerging countries for not revaluing their currencies or imposing capital controls. As U.S. Treasury Secretary John Connally said to foreign finance ministers in 1971, "The dollar is our currency, but it's your problem." Indeed. Recently, much of QE's effects have been felt in emerging-market countries. This is a response not just from the U.S. Fed but from the BOJ, ECB, and BoE. Unlike the sick, indebted developed world, many emerging-market countries are growing and doing well. [Let me remind you that we wrote this in August 2013!] We have not seen a lot of borrowing in the developed markets. Instead, growth of credit and lending to private borrowers is happening in emerging markets. Emerging markets have been a popular target of excess capital for a number of reasons: their overall ability to take on debt remains strong, and their balance sheets are still relatively healthy; and more importantly, investment yields have been high relative to sovereign competitors. This two-speed world presents enormous problems. Code Red-type policies in the developed world are leading savers and investors to flee very low rates of return at home in favor of putting money into Turkey, Brazil, Indonesia or anywhere that offers higher rates of return. Code Red-type monetary policies are designed to produce investment and growth, and they are! Just not in the countries that central banks intended to help. This is a major headache for governments in these countries. For them it is like having loads of visitors drop by all of a sudden. It is flattering that they like your house; but after a while, you'd rather they didn't show up unexpectedly. Hot money flows are like drunken guests. They create a very big party, they leave unexpectedly, and they leave a god-awful mess behind. Large hot money flows have been behind most major emerging-market booms and busts. Whenever major, developed-world central banks keep rates at very low levels and weaken their currencies, they cause bubbles. Let's look at two recent bubbles and crashes that Code Red policies helped cause. After the Japanese bubble burst in 1989, the bank of Japan cut interest rates close to zero. By 1995 the dollar/yen exchange rate weakened, and the yen lost almost half of its value. The Japanese took money out of Japan and put it into Indonesia, Korea, Malaysia, Philippines, and Thailand. Investors in other countries borrowed money either directly in yen or through synthetic instruments. It was called the yen carry trade, and it was designed to take advantage of easy Japanese money to invest elsewhere. Everyone assumed that the yen would continue to go down, making the terms of repayment easier. Asia attracted nearly half of the total capital inflow to emerging markets, and the stock markets of South Korea, Malaysia, Singapore, Thailand, and Indonesia were soaring. The party didn't last forever. When the Thai currency came under pressure in June 1997, almost all Asian countries faced stock market crashes, capital flight, currency depreciations, and banking busts. The entire Asian episode perfectly fit the five stages of a bubble, but it was certainly much greater than it otherwise would have been, given the policies of the Bank of Japan…. The idea that ultra-low interest rates cause booms and busts is not new. Economists of the Austrian school, led by von Mises and Hayek, warned that credit-fueled expansions lead to the misallocation of real resources that end in crisis. In the Austrian theory of the business cycle, the central cause of a credit boom is the fall of the market rate of interest below the natural rate of interest. Investments that would not be profitable at higher rates become possible. The bigger the deviation of interest rates from the natural rate, the bigger the potential credit boom and the bigger the bust. Like all bubbles, rapid price increases can rapidly reverse when interest rates return to normal levels. The greatest danger will then be to leveraged investors who bought farmland, corporate bonds, some emerging markets, and other bubbles with borrowed money. The US Federal Reserve has begun to taper by $10 billion a meeting. That means they are still putting $65 billion a month into the world economy. Let's do a thought experiment. If the Fed had originally announced they were going to do $65 billion per month in QE rather than the $85 billion they did announce, would it have made any difference in the overall outcomes? I would suggest there is not a great deal of actual difference between $85 billion and $65 billion. Yet now the markets are acting as if there is some massive difference. I would submit to you that the difference is actually in the narrative. The Federal Reserve is signaling that it is going to end quantitative easing at some point in the future; therefore, investors are trying to find the exits before the end actually comes. But does it make any real difference to your portfolio whether it's the reality or the narrative that is driving the volatility in the markets? The trouble in emerging markets is just beginning. Hot money has been chasing a growth story across the emerging markets since early 2009. Trouble is, the real driver of economic growth in emerging markets is not the explosive force of eager, low-skilled workers as they climb into the middle class. That's just the story you hear from mutual fund salesmen. That's like saying the economy grows over time because we all get raises and spend the new income on plasma screen TVs. Emerging-market consumption is a RESULT of growing incomes, not the CAUSE. The real driver of long-term global growth has been the great spurts of innovation enabled by the last two industrial revolutions. Dr. Gordon was absolutely right to proclaim the end of the Second Industrial Age. It began to pass away in the 1970s, and except for the boost from the 1980s through the early 2000s due to the advent of personal computers, the world economy has essentially been running on the fumes of a dying growth model, an unprecedented but now-deflating credit bubble, and the last high-spending years of wealthy but aging populations in the developed world. As he attempts to peer beyond the chaos of debt, deleveraging, bankrupt governments, and desperate central banks that will ensue for the next five to ten years, Dr. Gordon's dark and dire predictions about long-term growth hinge around the fact that he can't see the rapidly accelerating technological transformation that promises to drive another century of explosive innovation. He doesn't think it can happen again. 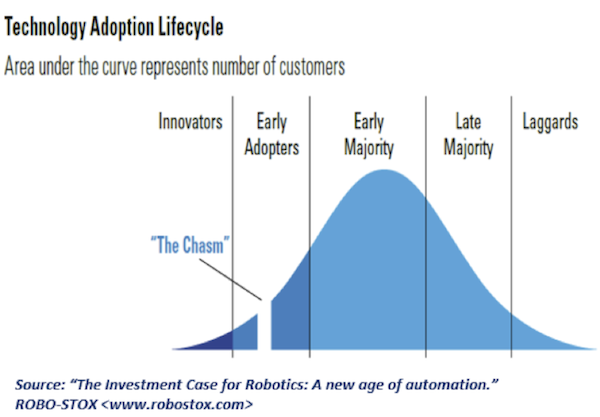 Identifying the next set of world-changing technologies before it "crosses the chasm" is infinitely harder than calling a market peak or a rare turn in the long-term credit cycle. In all of human history, we have seen only TWO sets of world-changing technologies that enabled centuries of follow-on innovation, inspired dynamic new industries, and revved up the faltering growth engines of ages past. You would have to be extremely close to potentially world-changing technology to notice when it first leaps across the chasm, goes parabolic, and begins to drive a fresh explosion of innovation, productivity, and then – and only then – income. But as you already know, the constant doubling of computing power since the late 1950s (known as Moore's Law) has reached a point where our technological capabilities are taking exponentially larger leaps every year. And that constantly accelerating computing power is already enabling a massive round of follow-up innovation so disruptive that it looks and feels like magic. That is great news for the human experiment and great news for the privileged minority in developing countries ... but it could be terrible news for the vast majority of people in emerging markets who do not have the skills to participate in this new economy. Contrary to popular belief, the real drivers of economic growth in most emerging markets are still investment and/or trade demand from the developed world. And those growth models – (A) attracting investment from the rich world to encourage development, (B) producing the things consumers in rich countries want, and/or (C) supplying the things manufacturing economies need to produce the things rich consumers want – are either running out of steam or becoming a lot more hazardous. Let's look at the longer-term challenge for export-oriented growth models first and then shift our attention to the sharp, Fed-induced reversal in capital flows that could devastate emerging economies in the coming months. Emerging markets can't depend on trade demand from the developed world. Like the First and Second Industrial Revolutions, the emerging era of technological transformation is going to leave a lot of people behind. It took more than 200 years for emerging markets to even begin catching up to their developed peers in the late 1900s, and as a general rule, that only happened when the captains of industry in developed markets saw opportunities to (A) improve their profit margins by continuously moving their manufacturing efforts to countries with cheaper labor, and (B) to develop additional markets for their products as workers' wages grew. Today, some of the most competitive businesses in emerging markets – and the world over – were home-grown in places like China, India, and Brazil. Rather than being controlled by developed-market multinationals, they are competing with them head to head … and often winning. But that doesn't change the fact that most emerging markets depend heavily on their relationships with customers and investors from the developed world. And it doesn't change the fact that the whole concept of manufacturing with low-cost, low-skilled labor is quickly going the way of the dinosaurs. That's because the exponential growth in computing power is rapidly enabling the creation of ever more capable and increasingly affordable software, robotics, 3D printing, and bio- and nanotechnologies. The transformation won't happen overnight, but over time many emerging markets are going to realize how difficult it is to grow their economies when developed markets no longer need them – when their developed-world competitors can consistently produce higher-quality products in automated factories instead of sweatshops in potentially unstable places … and when consumers can buy products online and simply print them out at home on advanced 3D printers. This is precisely why Erik Brynjolfsson and Andrew McAfee, authors of The Second Machine Age, recently wrote that "offshoring is only a way station on the road to automation." Emerging markets that depend on trade demand from developed-world consumers are already seeing a lot less of that demand as households, businesses, and governments go through the slow and destabilizing process of deleveraging. One of the major reasons why emerging-market governments ran large deficits after the financial crisis was that they hoped their customers would return. That is looking less and less likely as the US trade deficit trends toward a future surplus. Much to the surprise of almost every economist I know, the US trade deficit is already rapidly shrinking, thanks to a few big advances in drilling technology that have unlocked massive supplies of unconventional oil and gas. You know the story… And all of that cheap energy – combined with a negative real interest-rate environment – has given US manufacturers a serious edge over competitors in countries like Germany, Japan, and even China. That competitive advantage is bringing a lot of manufacturing home at the same time that supply-chain-disrupting technologies like robotics and 3D printing are becoming capable enough to take over the repetitive tasks that are common in sweatshops – and at lower cost. Export economies that don't adapt will be left behind. I can't predict what this or that country can or will do to adapt, but the outcomes will most likely be idiosyncratic. There will be many winners and a whole lot of losers. We will just have to wait and see who rises above the pack. The problem is that accepting unlimited short-term investment capital flows from developed markets subjects emerging markets to a painful cycle of boom, bust, and currency collapse. India's top central banker made headlines this week when he accused the Federal Reserve of "attacking" emerging markets by continuing to shrink its quantitative easing program. And honestly, from his perspective, it's hard to argue with him. In case you don't know him – and most people don't – Raghuram Rajan is one of the brightest economists in the world and one of the few academics who accurately predicted the 2007-2008 global financial crisis. I was privileged to get to know him as we spent three days together flying around Scandinavia doing speeches last January, prior to his being appointed as the governor of the Reserve Bank of India. An old-school gentlemen, he has a mischievous, wicked sense of humor and a clear command of the economic literature. An alumnus of the Indian Institute of Technology (IIT) in New Delhi, the Indian Institute of Management (IIM), Ahmedabad, and the Massachusetts Institute of Technology, and a gold medallist all through, Rajan was the youngest economic-counsellor and chief economist at the IMF from October 2003 to December 2006. His peers, in a poll conducted by The Economist, called him an economist "with the most important ideas for a post-crisis world", which was a rare distinction for a person of Rajan's age. He was all of 48 then. He shot to global fame when his prediction of a looming global financial crisis way back in 2005 eventually became a reality three years later – even though, in the interim, he had to face ridicule of such luminaries as then Federal Reserve chief Alan Greenspan and Nobel laureate Paul Krugman. What started as a paper titled "Has Financial Development Made the World Riskier? ", resulted in an Academy Award-winning documentary called "Inside Job", bringing Rajan into global limelight, as also the sights of Prime Minister Manmohan Singh who made him honorary economic advisor. In short, this guy is a major player who knows all the other significant economic thinkers on the scene today. Now back to our narrative. For years now, central bankers across the emerging markets have complained that QE, ZIRP, and other "financial repression" policies coming out of the developed world – and most importantly from the Federal Reserve – have been driving hot capital flows into emerging markets. It was all part of the developed world's plan, they say. By holding interest rates low and pumping a lot of extra liquidity into the markets, the Fed was intentionally pushing real interest rates into negative territory. You know most of the story. Bernanke's Fed decided to limit the losses from years of reckless risk-taking by promoting even more reckless risk-taking. When real interest rates went negative on the world's reserve currency, it punished anyone who chose to hold cash and rewarded anyone who chose to take risk. And the more risk you took, the bigger the pay-off … at least at first. More importantly, the differentials in real interest rates between many emerging markets and their more developed peers was enough to send capital running in search of higher yields on bonds that many people perceived to be "safer" (or at least more profitable) than those issuing from traditional safe havens. The Fed might as well have aimed its big bazooka right at the emerging world. Less-developed markets have been huge recipients of developed-market capital flows since the "recovery" began in March 2009 – as if we were all still living in a naturally strong environment for global growth. The conventional wisdom, the narrative that became commonplace in the media, suggested that emerging markets were – for the first time in a long time – less risky than developed markets, despite their having displayed much higher volatility throughout history. As a general rule, people believed emerging markets had much lower levels of government debt (missing the fact that crises in the 1980s and 1990s still limited EM borrowing limits until 2009), much stronger prospects for consumption-led growth (missing the fact that EM consumption is a derivative of demand and investment from the developed world), and far more favorable demographics. Instead of holding traditional safe-haven bonds like US treasuries or German bunds, some strategists (who shall not be named) even suggested that emerging-market government bonds could be the new safe haven in the event of a major sovereign debt crisis in the developed world. And better yet, it was suggested that denominating these investments in local currencies would provide extra returns over time as EM currencies appreciated against their developed-market peers. Well, the results are in, and sadly, the conventional wisdom on emerging markets was dead wrong. A broad investment in the MSCI Emerging Markets Index – the way most retail investors around the world bought into the "EM growth" theme – returned over 150% from March 2009 to the top in April 2011. Since then, the index is down over 22% – during which time more and more investors got sucked into the hype of the "growth" story. The average holding period for an underperforming investment fund is approximately three years, and we are coming up on that mark! And as it turns out, the single asset most sensitive to Fed tightening is emerging-market local debt. 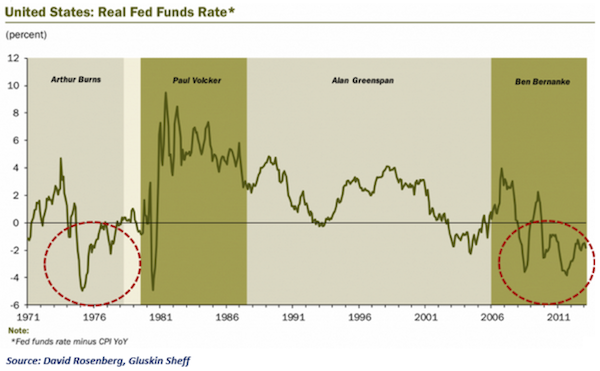 Ray Dalio's team at Bridgewater laid out the data on that after the original spike in rates last May. I wish I could share it with you. This is a critical idea as last summer's "Taper Tantrum" gives way to this winter's "Taper Trauma." Tapering has revealed a big weakness in the global economy. At first, reducing QE by $10 billion per month seemed like a relatively meaningless amount in a world where trillion-dollar bailouts have become acceptable if not commonplace. But the Fed's last move was HUGE in terms of the overriding narrative in global markets. As my friend Ben Hunt said recently, Ben Bernanke turned a single data point into a line during his last months in office. He established a trend, and the markets are reacting as if the Fed's exit strategy has officially begun. Whether the Fed can actually turn the taper into a true exit strategy ultimately depends on how much longer households and businesses must deleverage, but the markets now believe this is the beginning of the end. And the Fed sent a very clear message to the rest of the world: now it really is every central banker for himself. As you can see in the chart below, emerging-market currencies are taking a beating. Since Chairman Bernanke's first taper warning on May 21, 2013, the "Fragile Five" (Argentina, Indonesia, Turkey, Brazil, and South Africa) have seen their currencies fall more than 15%. The Indian rupee fell 12%, but the damage could have been far worse if not for a quick and absolutely brilliant response by Rajan, who started raising the RBI's target interest rate as soon as he took office in September. The inflection point is pretty clear in the graph above. It coincides almost precisely with the date he took over. I know a lot of people are wondering why EM central bankers are complaining about capital flows going out after they have been complaining about too much hot money coming in over the last five years. Rajan's comment on that point is very direct: "We complain when it goes out for the same reason it goes in. It distorts our economies. And the money coming in made it more difficult for us to do the adjustment which would lead to sustainable growth and prepare for the money going out." Rajan is responding to indiscriminate waves of capital flight by trying to establish credible forward guidance. And his team must make it work. He knows he loses (and India loses) if he cannot convince the markets to continue funding India's government and investing in its turnaround. You can practically hear the stress in Rajan's voice and see the gravity etched in his face when he replies "ABSOLUTELY NOT!" when asked if recent rate hikes were meant to protect India from contagion risk. I have seen that face before on Ben Bernanke in March 2009 and on Mario Draghi in July 2012. Rajan is urgently and emphatically trying to draw a line in the sand. You can tell he knows the consequences if he is not successful. Money flowing into India (along with many other emerging markets) contributed to overinvestment, overheating, and higher inflation. Easy money gave the Indian government – along with a lot of other EM governments – an excuse to avoid growth-supporting reforms. Normally, higher inflation would push real interest rates down and push money out as the overheating economy cooled – but the years since 2008 have not been normal. Low or negative real interest rates across the developed world kept the capital flowing to emerging markets. Overinvestment gave way to disappointing returns and – with a sharp change in the market's belief about the trajectory of developed-world interest rates – triggered capital flight. It's actually very simple if you think it through step by step. Today, the money going out is wreaking havoc in government bond markets in precisely the same way as happened across Asia in 1997-98 and in Europe since 2010. While their currencies are taking a hit, notice that Brazil and Chile have avoided the negative bond-market effects with pre-imposed capital controls. That may be the "new normal" for emerging-market monetary regimes in the future, and Rajan strongly hints that he is considering that strategy. Industrial countries have to play a part in restoring that [co-operation], and they cannot at this point wash their hands off and say, we will do what we need to and you do the adjustment you need to. If they insist on that, we will certainly do the adjustment we need to, and we are certainly in India in the process of doing that, but they may not like the kinds of adjustments we will be forced to do down the line. In the meantime, high inflation rates are contributing to the giant sucking sound as capital runs away from emerging markets indiscriminately. Central bankers need to get inflation down to correct the cross-border differences in real interest rates if they want to keep government borrowing costs anchored. Rates have risen across the developed world, too, since the first mention of Fed tapering; but rich-country central bankers – even the stingy ECB – had more tools at their disposal to adjust their policies. Understanding those policy mechanics all too well, Rajan may have played his hand better than other fragile, overexposed emerging markets have. India's was the worst-hit of the EM currencies by early September, so Rajan had to act. The trick is, he had to act without revealing how weak India would be in the event of contagion. Fortunately, I think we've had a few months in India to prepare, given that first inkling that there would be this withdrawal of the money, given the wave of attack we saw in terms of money flowing out. I think we are much better prepared now, but I would still say international monetary cooperation has broken down. Instead of waiting for an FX crisis such as we seen the past few days in Argentina, Indonesia, Turkey, Brazil, and South Africa before he shored up the rupee, Rajan raised rates as soon as he took over as head of the RBI. Like an Indian Paul Volcker, he took a stand against inflation and laid down forward guidance very intentionally, saying that the RBI would raise rates if future disinflation did not come soon enough. That move was brilliant, in my opinion. It gave Rajan the ability to improve India's position relative to the other exposed EMs … while Turkey doubled its target rates only to see the lira slide further. In the interview he built on that strength by stating that "a collateral benefit of getting inflation down is that you also strengthen belief in the value of the rupee from an external perspective – the exchange rate." Somebody who puts in equity or FDI into this country is looking at long-run returns; but if those returns are eroded by rupee depreciation, they're not so happy. So you want to assure them, "Bring in your money. Bring in your 3-year, 5-year, 7-year money. And I will promise you at the end that you will get an adequate return in dollar terms. It also sounds like a promise to impose capital controls if the pressure worsens. According to Rajan, allowing the rupee to adjust while inflation pushes down on Indian real interest rates is a recipe for the kind of currency crisis that turned Thailand, Malaysia, Indonesia, and South Korea into a living hell in 1997. It's easy to forget the second- and third-round effects. And not many people remember that China avoided sharing in their pain – putting the Middle Kingdom in a more advantageous position for the long run – by pre-imposing capital controls. You see, the nostrum amongst economists here is "Let the prices adjust and things will be fine. Let the exchange rate move; let the money flow out; and you will figure it out. That is often a reasonable prescription for an economy that has its fundamentals, as well as its institutions, well-anchored. But when those aren't anchored, what happens is the volatility feeds on itself. Exchange rates fall. Stop loss limits are hit. More selling takes place. Then some firms get into difficulty because they have unhedged exposures. Government budgets get hit because they're not hedged against currency fluctuations. There are also second- and third-round effects which happen in a country which is not as advanced or industrialized. Either Rajan gets inflation under control or he locks up investors' capital just like a hedge fund manager who restricts liquidity to "protect" his investors. A time like this can be the best time to invest, or it can be the worst. You really have to do your research on a country-by-country basis. But while Rajan is speaking for India, I get the feeling he is also speaking for the entire group of emerging-market central bankers who feel betrayed by the Federal Reserve and know what could come next. One of the lessons that hedge fund investors learned (quite painfully, as it turned out) in the last crisis was that their biggest unforeseen risk was from fellow investors who tried to pull their money out, forcing a radical adjustment in the market price of whatever asset was being invested in. I will be doing a paper on this topic sometime in the near future, but as an investor you want to make sure that your investment horizon is matched by the duration risk of your fellow investors. If a project is going to take five years and you want to be part of that investment, then you want to make sure you are in a fund with real five-year money. 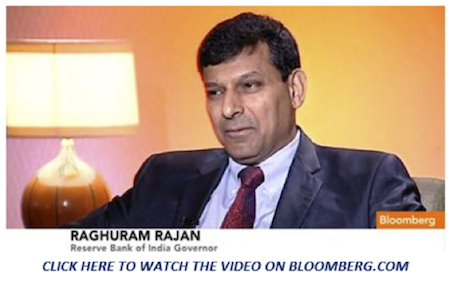 Rajan is simply saying that what is good for a hedge fund might be good for a country. The US and other developed markets have the tools and capital structure that make capital controls unnecessary. Perhaps that is one way to determine the difference between an emerging market and a developed market. When you don't care about capital inflows and outflows in the short term, then for all intents and purposes you have arrived. The Fed giveth and the Fed taketh away, but true long-term growth always comes from innovation. Since many emerging countries are behind the curve in developing internal markets for their products, I suggest you invest very carefully, very cautiously – and dear gods, please don't put more money than you can afford to lose in these markets in the blind expectation of growth. Fickle capital flows and FX crises are facts of life in a Code Red world. There could be plenty of pauses between the inevitable bouts of pain … or the pain could all come at once. Get ready for a wild ride, and if you want to invest where the growth is, focus on the companies and countries that are implementing the technologies that will drive that growth. I am enjoying my extended stay in Dallas, but it looks like my schedule is filling up with travel in the future. Quick trips to Los Angeles, Miami, Houston, Washington DC, and perhaps New York City are all in the works. A longer vacation in Cafayate, Argentina, may be followed up by a speaking tour in South Africa. It will be an interesting time to visit both countries. Then of course it will be time for my own conference, May 13-16, in San Diego. Let me invite you to join me there. So far, our annual Strategic Investment Conference, cohosted with my partners Altegris Investments, will feature Niall Ferguson, Kyle Bass, Ian Bremmer, David Rosenberg, Dr. Lacy Hunt, Dylan Grice, David Rosenberg, David Zervos, Rich Yamarone, my Code Red coauthor Jonathan Tepper, Jeff Gundlach, and Paul McCulley, with a few more surprise names waiting to confirm. Nothing but headliners, one after the other. When I first broached the idea of our conference to Jon Sundt, the founder of cosponsor Altegris, the one rule I had was that I wanted the conference to be one I would want to attend. The usual conference boasts a few headliners, and then the sponsors fill out the lineup. I wanted to do a conference where no speaker could buy his or her way onto the platform. That means we often lose money on the conference (hard as that may be to imagine, at the price); however, the purpose is not to make money but to learn with – and maybe have some fun with – great people. We do put on a great show, and my partners make sure it is run well. But the best part will be your fellow attendees. A lot of long-term friendships are forged at this conference. You can learn more and sign up at http://www.altegris.com/sic. And I just can't leave you without mentioning that when I was in Vancouver last week I was invited to dinner by the noted mining and filmmaking executive Frank Giustra, and it turned into one of the most stimulating evenings I have enjoyed for a long time. 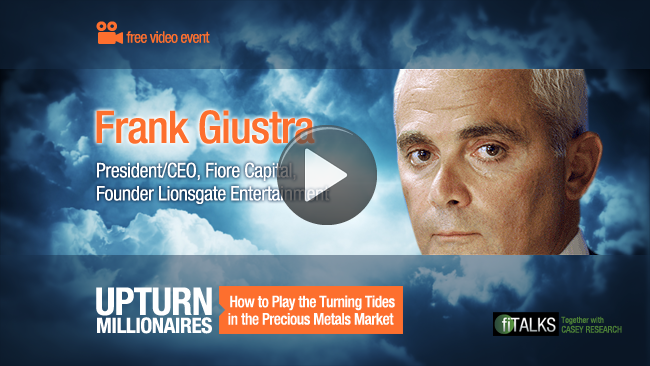 Coincidentally, Frank features prominently in an upcoming Casey Research video event, Upturn Millionaires (How to Play the Turning Tides in the Precious Metals Markets), which will air on a computer near you on Feb. 5 at 2 PM Eastern. You can tune in right here and reserve a seat. Most of the kids and a bunch of friends will be gathering tomorrow afternoon and evening for the traditional chili, barbecue, and chips and guacamole while we watch the Super Bowl. As one of my kids pointed out, I could always turn my home into a sports bar, given the layout and the number of TVs. Tomorrow we will do just that. Finally, let me thank my young associate Worth Wray, who was extremely helpful in producing this week's letter. You're going to see his name more, I can promise you. And now, since this letter is already too long, let me just hit the send button. Have a great week! Feb. 11, 2014, 3:40 a.m. The concept of a living hell in the emerging markets you mention in the nineties is interesting. I lived in Malaysia at that time, and while as a foreigner with a career interest in capital markets all I could see was the coming armageddon, my local friends used to ask me where exactly this disaster was. They still had jobs, they consumed largely local produce and they had not been among the leveraged few (but large) who were caught up in property speculation. Of course, it’s worth remembering that Malaysia quickly defied the conventional IMF nonsense that doubled the pain in Thailand and Indonesia, so the lesson is really that it is IMF orthodoxy, based on studying the past not the present, that creates living hells. Let’s hope it learned its lesson before (or because) Rajan was the rising star there. Feb. 5, 2014, 9:22 p.m.
Code Red-type monetary policies are designed to produce investment and growth, and they are! Well, no. I would argue that those policies are designed to produce consumption as a result of people borrowing money more readily. It is thought that by promoting consumption, growth and investment will follow. Of course, we know that it won’t work unless the resulting growth and investment eventually and substantially outpaces the borrowing that occurred and that such growth and investment occurs in the same economy in which the borrowers are operating, a risky proposition at best. In an economy with weak fundamentals, and particularly one that is already overly-indebted, this “strategy” is almost certain to fail precisely because the economy in question is already a debt economy. 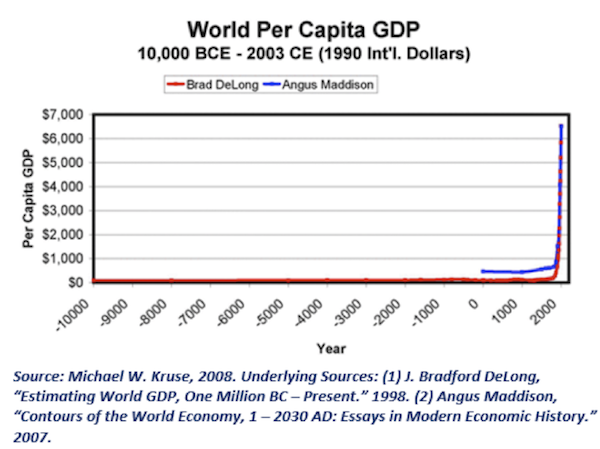 The only way an indebted economy can truly recover is by converting to a producing economy, i.e. one in which it produces more than it consumes and in which the excess product is sold off to other economies. And the only way that can occur is if it crashes enough that its labor pool becomes sufficiently price-competitive. Devaluing the currency can work only if producing nations (which have a cash surplus) don’t play the same games. The bottom line is that until the U.S. economy crashes to the point where U.S. labor becomes competitive in terms of real cost per man-hour with that of the rest of the world, no amount of currency manipulation will result in restoration of the U.S. economy to health, because currency manipulation alone cannot suddenly make labor in the U.S. cost-competitive. Indeed, as government intervention becomes ever more burdensome and onerous, labor in the U.S. will become ever more unappealing, and the U.S. economy will grow ever worse as long as this trend continues. Feb. 3, 2014, 9:20 p.m. This sentence should also be read as “That is great news for the human experiment and great news for the privileged minority in developing countries ... but it could be terrible news for the vast majority of people in DEVELOPED markets who do not have the skills to participate in this new economy.” The fact is that about half of our people cannot earn a living wage in a high tech society where unions are dying, robots are doing and jobs are exported to the lowest bidder. Feb. 3, 2014, 11:33 a.m.
You start by explaining that there’s a currency war going on, where the various Governments try to acquire a competitive advantage by devaluing their currencies. This has actually been a theme of yours for quite a time. Then , at the end, you explain that those same countries are trying to shore up their currencies in reaction to the Fed’s action. Shouldn’t india, Turkey, et al. be happy for their currencies to be devalued, vis-a-vis the developed world currencies, so as to be able to export more and keep their factories up and running? Feb. 3, 2014, 4:37 a.m.
It’s always the same story: Too much short-term debt or too much debt debt based on short term rates. Now it’s again the fault of the West. Why did some of he countries mentioned in your article not use the low interest rates of the last five years to borrow long term in the bond markets where investors were desperate for better yields? This would have lessened the dependency on international money markets or provided long term funding for domestic investments. Feb. 2, 2014, 10:46 p.m. The more interconnected we are the more interdependent we become. A butterfly flapping its wings in Greece a few years ago threatened the entire global economy. Now the elephant in the room is reminding us of former Treasury Secretary John Connally’s famous line in the early 1970’s…“the dollar is our currency, but your problem”. Should the US central bank now be responsible for ensuring the strength and sustainability of every sovereign economy in the world? Sounds idealistic and compassionate, but not practical. Maybe that is why Bitcoin is getting more and more attention. Is the world in search of a pure global currency that can’t be manipulated by any sovereign central bank? We may just be at the beginning of such. Feb. 2, 2014, 2:16 p.m. “...If there is a surprise – and with continued growth there might be – it will be to increase the amount of easing each meeting…”. Seems “tapering” was meant instead of “easing”.